“I have mixed feelings. Top ten was my minimum goal. The sixth place isn’t a bad result, but it could have been better. At first I wasn’t positioned well." Tony Gallopin finished in the top ten of the Amstel Gold Race. In a sprint with eighteen riders the Frenchman was sixth. The early breakaway consisted of six riders. They had a maximal lead of eleven minutes. In the peloton Movistar, Orica-GreenEdge and mainly BMC led the chase. Before halfway, Jelle Vanendert hit a car. He has abrasions and hurt his left shoulder and hip. Normally he will be able to start in the Flèche Wallonne. On the Eyserbosweg, the 28th hill of the day, Simon Clarke and David Tanner bridged to the last two escapees. Later three others, one of them was Nibali, joined Clarke and Tanner. With eight kilometres to go all escapees were caught. A reduced peloton started the last ascent of the Cauberg with top at 1.7 kilometres from the finish. Tim Wellens tried to answer an early move of Ben Hermans. On the top Philippe Gilbert and Michael Matthews had a small gap. A group with Tony Gallopin could return and a sprint decided about the victory. World champion Michal Kwiatkowski won. Alejandro Valverde was second, Michael Matthews third. 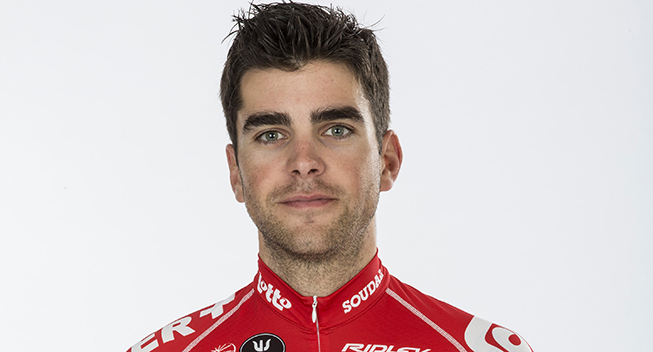 Tony Gallopin finished on the sixth place.